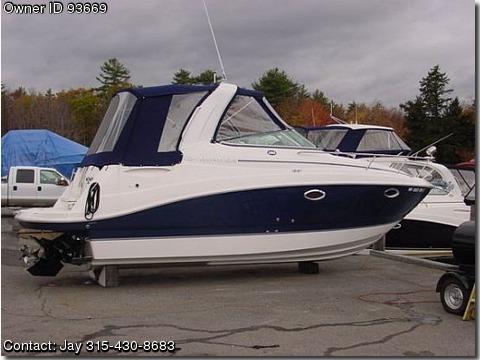 Call Boat owner Jay 315-430-8683 Looking for a boat that has it all? This boat has: Big Block engine with Mercruiser Bravo III outdrive. Trim Tabs Radar Arch Depth finder Refrigerator/Microwave/Stove (Microwave/stove NEVER used) Full Head with shower Flat screen TV with built in DVD Player AM/FM/CD player with built in Sirius Satellite Radio (Controlled in the cabin, at the helm or from the Swim platform) Swim Platform Shower Hot/cold water AC/Heat Sink in bathroom, in the cabin as well as on the counter on deck. Ice Maker on deck Plenty of Storage Ship to Shore Radio ONLY 85 hours Always stored in heated storage with yearly maintenance on hull and engine.